At the insistence of Glenn Beck, I finally read In the Garden of Beasts. I have to say, it wasn’t full of revelations for me, but it was an interesting look into some Americans living in the early days of Nazi Germany. The thing that was the most interesting to me was how much the Nazis were in control of the culture so quickly. For some reason, I didn’t really think of the culture being so dominated by the Nazis before Hindenburg’s death. The other thing I noticed (Thanks to Glenn Beck), that I haven’t noticed too much before is how historians write. I did the same thing in my historical writing as well. There is this urge to include all of the interesting facts I learned I while doing research. At any rate. 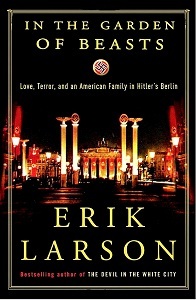 I think it’s a good read, it’s not my favorite book on Nazi Germany, but it does offer a different perspective.